With Afternoon Tea Week in full swing, I’m sure there are many happy tummies around the UK. But if you don’t want to go out, this is the perfect time to have your own afternoon tea celebration at home. You could do this as a solo venture or invite some friends over, but I think this week provides an extra excuse to give yourself 15 minutes of genuine break time. Of course, you could do this (and probably should do this) every week, but sometimes having a little reminder is a good. A cup of tea isn’t just about having a soothing break; tea is also a great flavour option. I love adding matcha (potent green tea powder) to baking and black oolong tea adds a delicious flavour to fish such as mackerel when smoked. Even good old English Breakfast tea works well. Delicately poached nectarines and peaches with a light Breakfast Tea syrup are a lovely addition to breakfast porridge. I’ve stuck with the tea and fruit combination for this week’s ‘afternoon tea break’ bake. It started with some brown bananas in my fruit bowl that were calling out for love and attention. They were in the perfect condition for baking as it’s best to use bananas when they are as soft and squishy as possible. 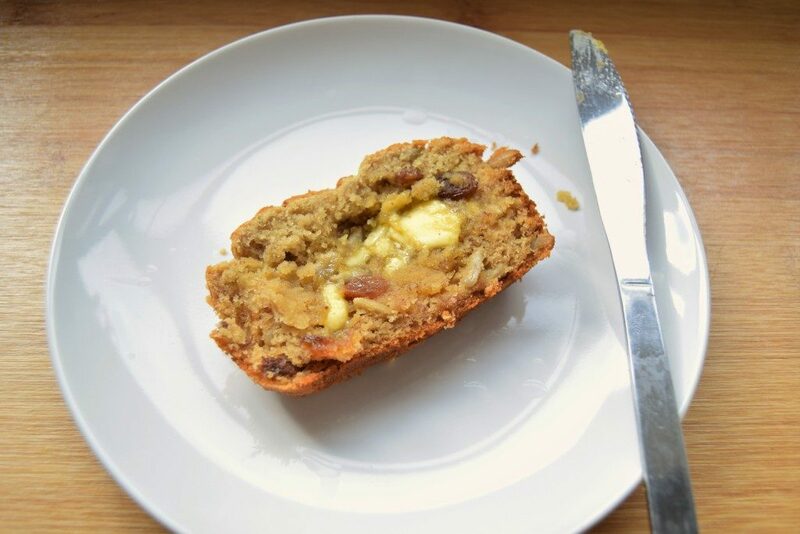 I think that a slice of fluffy banana bread is one of the nicest things to have with a cup of tea in the afternoon. This stalwart of Aussie cafes hasn’t quite transferred to UK cafes in the way flat whites have, but I wonder if it too will be a regular fixture on London cafe menus. I also wanted to incorporate some tea flavour in the loaf, not just as something to have alongside it. 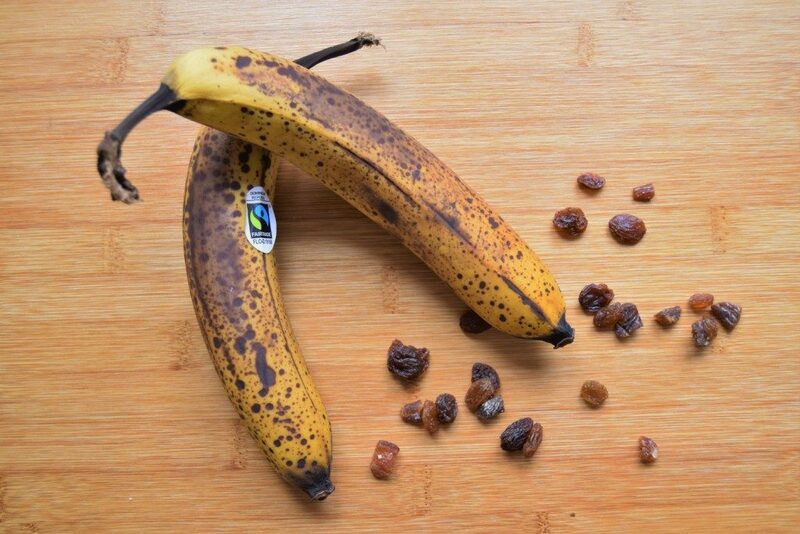 A good way of doing this is by soaking sultanas in strong tea until they are well infused. I used sunflower seeds in place of the standard walnuts, but feel free to use your nut of choice. 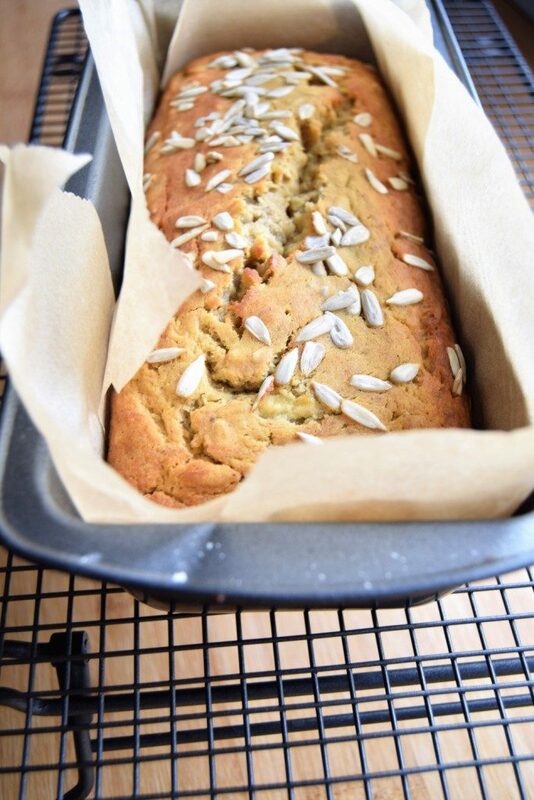 As the bananas and sultanas add a level of natural sweetness, there’s too not much extra sweetness needed, but a little honey is a nice complement to the sunflower seeds. This is also a gluten free loaf. 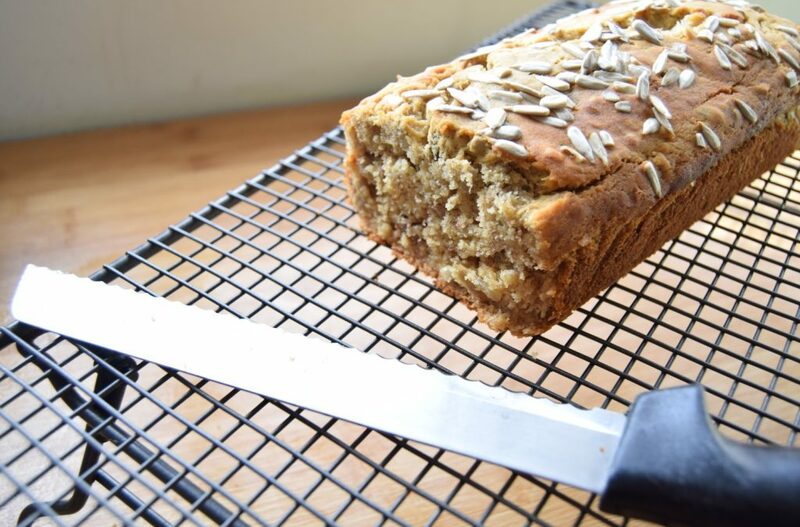 I really like the texture of rice flour in banana bread as it makes it light and fluffy (I actually prefer it to the normal wheat version) so even if you can eat gluten, this is a tasty piece of cake. 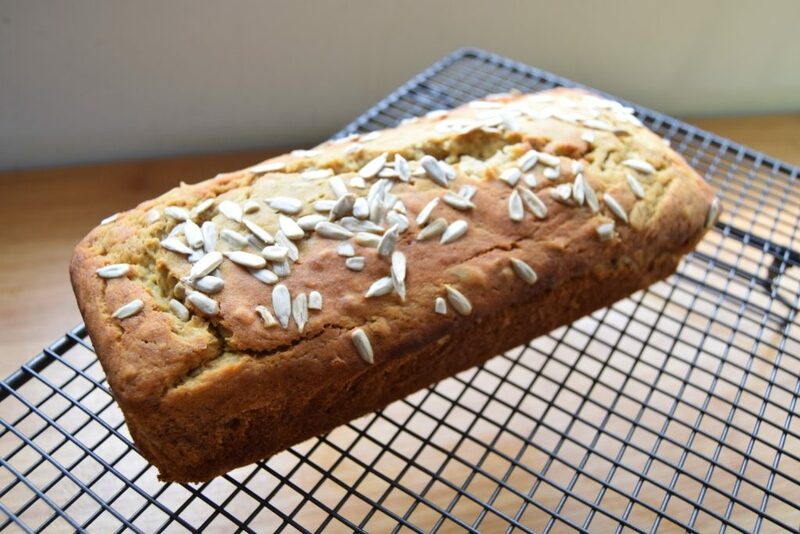 Banana bread is particularly good when served slightly warm or even lightly toasted. If you can cope with dairy, a good slather of creamy organic butter is a nice addition. You could also top it with a scoop of ricotta and some berries. 3. a soothing cup of tea. This is not a time to be rushed or harassed; this is a time just for you and your warm slice of banana bread. Enjoy! 1. Put the sultanas in a small bowl and cover with hot tea. Leave to soak for 1 hour. They should be nice and plump, and soft. 2. 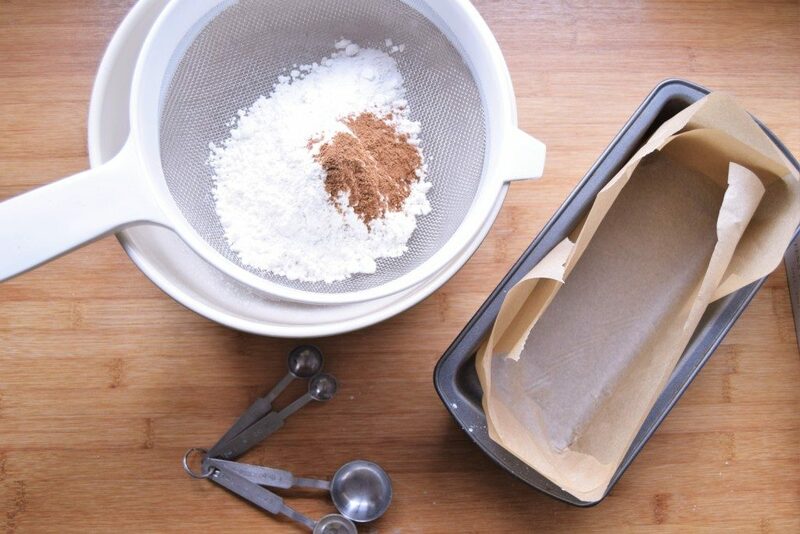 Line a 500g / 1lb loaf tin with baking parchment and preheat your oven to 180°C (160°C fan). Sift together the flours, baking powder, mixed spice and salt in a bowl. Add the sunflower seeds and mix through. 3. 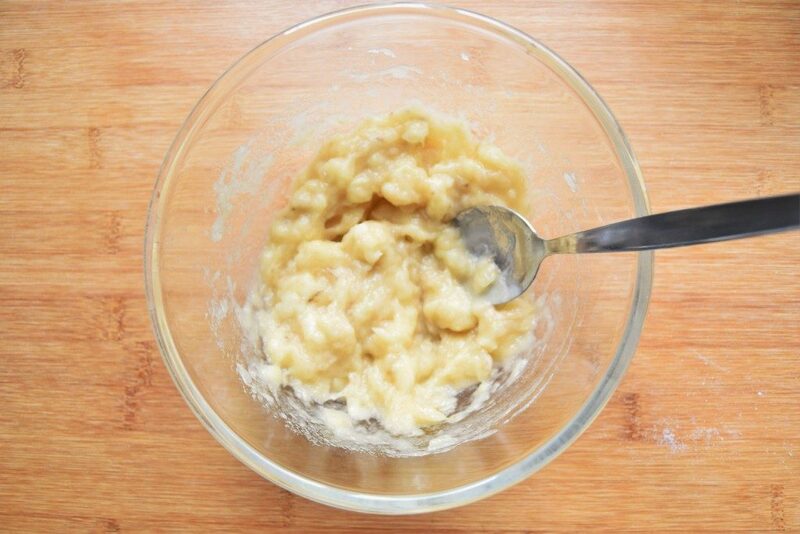 In a separate small bowl mash the banana into a puree. Break the eggs over the banana and beat through so everything is completely combined. Add the olive oil, honey and vanilla extra and mix again. 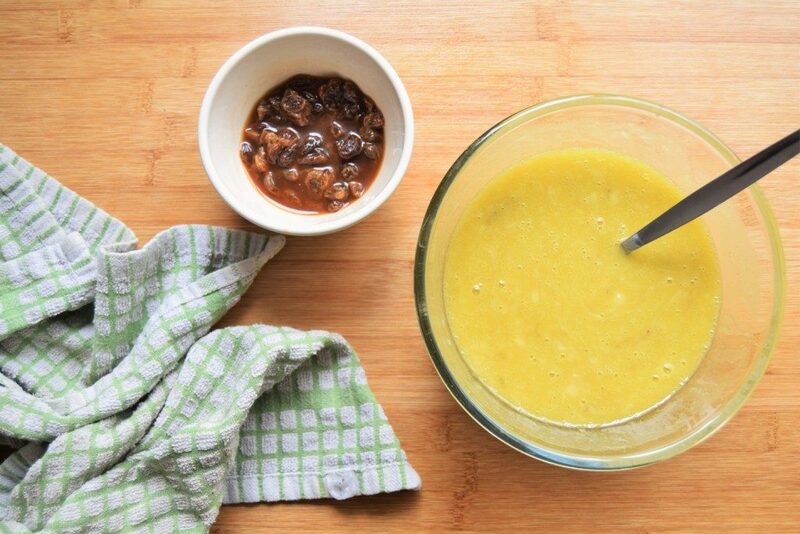 Next, add the sultanas with the tea liquid and stir all the liquid ingredients together. 4. 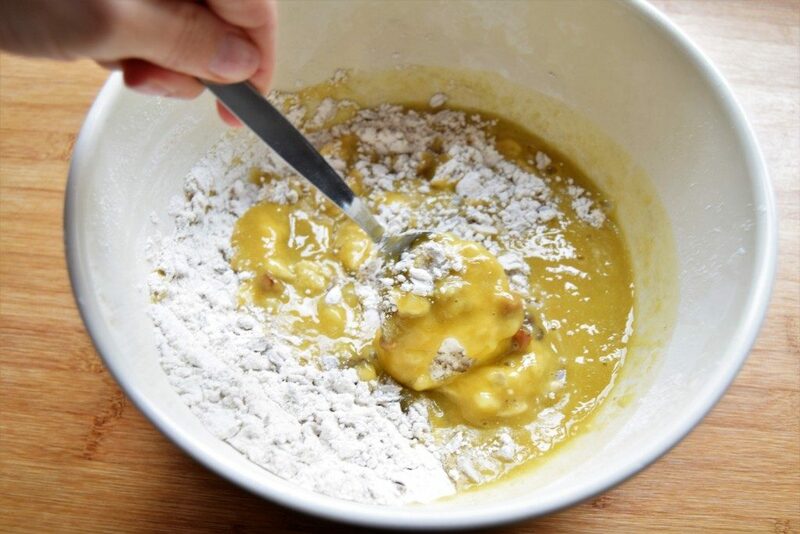 Pour the liquid into the dry ingredients and mix everything together so that the ingredients are completely combined. It should be quite wet, like a batter. 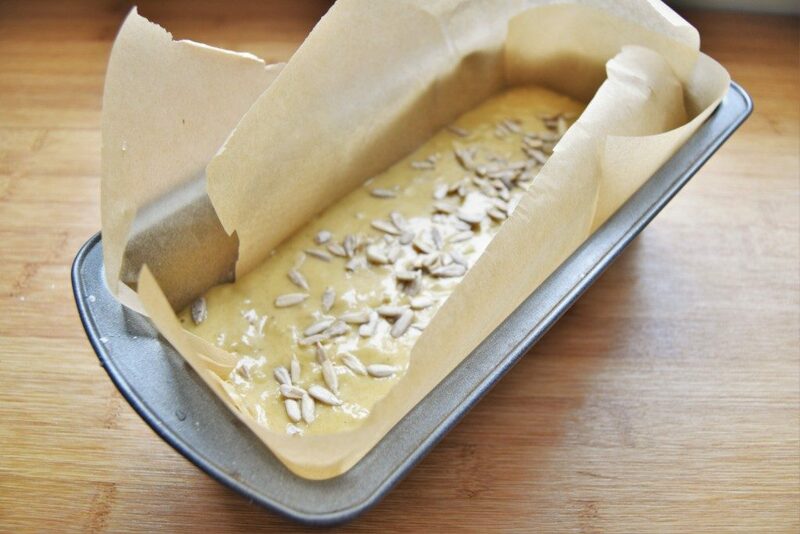 Pour the mixture into your prepared loaf tin and scatter a handful of sunflower seeds across the top. 5. Put the loaf on the bottom shelf of your oven. Bake for 50-60 minutes until a skewer inserted in the loaf comes out clean (I also turned the loaf once about half way through the baking). 6. Take the loaf out of the oven and put it on a wire cooling rack. Leave for about 10 minutes before carefully lifting it out of the tin. Peel the baking parchment off and leave it to cool a little. If you try and cut the loaf too soon it will fall apart; if you can resist, it’s best to leave for a little bit. The loaf will keep for a couple of days in a sealed container, but also freezes well. Can I replace the rice flour with normal flour? Would it be plain or SR? Yep, you can definitely use normal flour. I’d go for plain (and maybe add half a teaspoon of baking soda). Let me know how it goes!